I am currently researching Rueben Gilpin -my original thread is here. I have downloaded his service papers which state that he was ‘buried 15/10/1917 MAP Zonnebeke J.10.2.7’.He is remembered on the Menin Gate. Whilst I appreciate how his burial could have become lost I wonder if anyone who can do clever things with maps can pinpoint his original resting place for me. Is there a letter after the 10? A small a, b, c or d? I knew it was too good to be true! No there are no letters.Paticulars for the Roll of Honour of Australia states at a point just north north west of Westhoek Ridge East of Ypres. I was very interested to read the threads on Reuben. My great-uncle was killed on the morning of the 14 October 1917. Like Reuben he was in the 4th Division, AIF - although he was an NCO in the artillery which was obviously based in the rear areas. Although the Red Cross accounts are not always clear I believe he was killed and buried near the Kit and Kat bunkers on the Westhoek-Frezenberg ridge and he too is now commemorated on the Menin Gate. One account of his burial mentions the Kit and Kat track but I have never been able to find out the exact path of this or even which side of the ridge it ran. It is not too fanciful to suppose that they were buried fairly near each other. 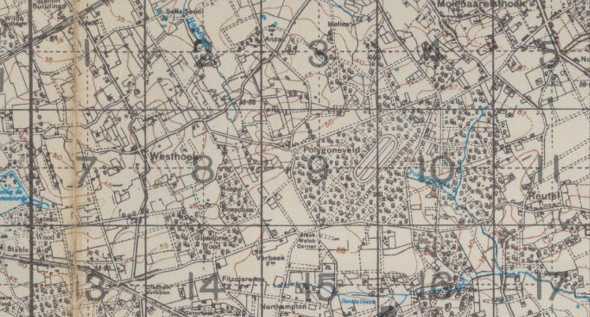 However, are you sure the map reference is J.10 as this is not on the Zonnebeke map but the Zillebeke map, it is also nearer the front line than where he was killed. Typically the area is on the edge of two maps but I think that Kit & Kat were in J.1.d - but am happy to hear any better suggestions. All locations are inside or within cooey of Polygon Wood. Thank you so much for your imput. Isn't it annoying when you know you've already been in an area but now you know new facts! Lindsey, the situation is a little more complex. 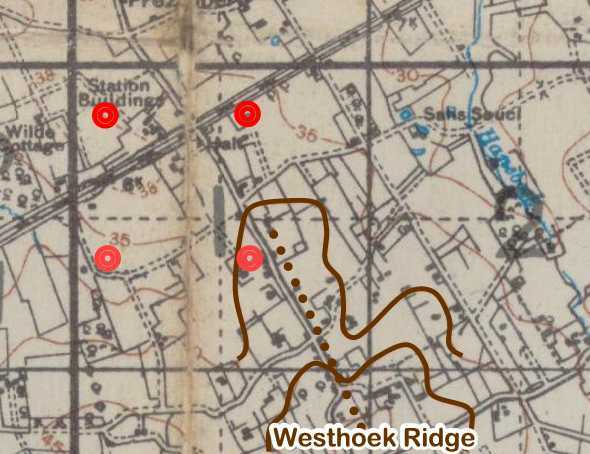 The description of NNW of Westhoek ridge does not fit with a burial around Polygon Wood. As you can see from this map segment, the town of Westhoek is located on the ridge. The ridge runs ~north-south. J10 is east of this area. North north east of Westhoek ridge would work. Thank you for the additional info that certainly fits with post 3 here and what I read in Bean's Official History. I don't know if the distance would work for him being killed at Westhoek and being buried in the vicinity of Polygon Wood. With (?) standing for a, b, c or d.
Wouldn't that have been north north west of Westhoek ? Thanks Aurel and Robert I think that this is the most likely explanation. If the ridge extends as far north as I have indicated, then the most likely spot is top right. This most closely matches the NNW direction, IMHO. This is probably as close as we will get with the current information. 1 UK and 16 Australians, fallen autumn 1917. Remains later moved to Hooge Crater Cemetery Zillebeke. And we know that beginning of 2006 Johan Vandewalle (and later Zonnebeke Passchendale Museum people) found remains of 5 Australians, fallen 25-28 Sept. 1917. But that was J.7.b.7.9 , not one of the locations marked by Robert. Thank you so much gentlemen. I take it that the book you refer to is The Ypres Salient Michael Scott ISBN 9781843423461 ? Sorry, yes, I should have mentioned the title of Michael Scott's book. You're correct. And indeed, I found "Westhoek Ridge Small Cemetery" in CWGC on line, with what you wrote, and 6 UK men (M. Scott mentioned only 1). I'll correct that in my notes. 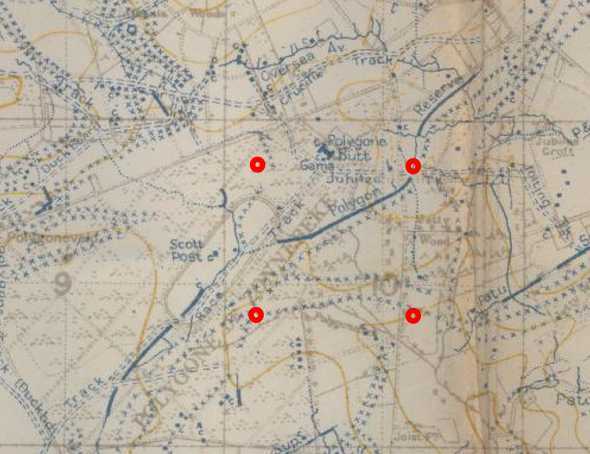 The problem is that J.10 and also J.1.c and J.1.d are not on the Zonnebeke map but the Zillebeke one. Also I don't think anyone killed on the Westhoek ridge would have been moved forward to Polygon Wood for burial. This suggests that the burial was either at J.1.a or J.1.b - the latter was closest to Kit & Kat bunkers so is probably the favourite. I might ask CWGC what detaails they have for burials at Westhoek Ridge Small Cemetery and which graves they were moved to at Hooge. If it helps, my Gt Uncle, William Wilson was originally buried at 28.j.1.b.2.1, which is next to Sexton House on the map (close to your thread above). He was subsequently moved to Artillery Wood Cemetery. He was killed 2.8.17 and served with 8th s/lancs. My great Uncle Patrick Joseph Byrne AIF 13th Brigade 5th Division Australian Field Artillery ser.no. 32129 was killed on 13th October 1917 and is commemorated on the Ypres Memorial (Menin Gate). I have been looking through his military files and they state that he was buried at Westhoek 28 N.E. and I was just wondering if he could be one of the 16 Australian Soldiers buried in the Westhoek Ridge Small Cemetery Zonnebeke. Any help to further my search would be much appreciated.